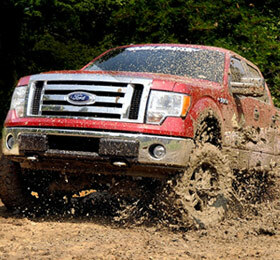 America has an on-going love affair with pickup trucks for a variety of reasons. For some a truck is necessary to perform their line of work. Other truck owners need the towing capacity to haul around a boat or horse trailer. Some truck owners just need the large bed to haul around all sorts of items, from gravel to barbecues. When it comes to full-size pickup trucks there are five models that stand out from the rest: Ford F-150, Ram 1500, Toyota Tundra, Chevrolet Silverado 1500 and Nissan Titan. Each of these models brings a level of toughness, capability, luxury and even fuel economy to the full-size truck segment. Also, many of these models come with clever added features that make them more useful on a daily basis. So without further delay, here is how these five top trucks stack up against each other. Only the Nissan Titan comes with a single engine choice, a 5.6-liter V8 that puts out a decent 317 horsepower and 385 pound-feet of torque. Nissan teams the engine up with a five-speed automatic transmission. Both the Ram 1500 and Tundra come with three different engine options. On the Ram 1500 the base engine is a Pentastar V6 that produces 305 horsepower and 269 pound-feet of torque. The engine works with an eight-speed automatic transmission. The next engine up is a 4.7-liter V8 that kicks out 310 horsepower and 330 pound-feet of torque. The third engine is a 5.7-liter V8 that puts out 395 horsepower and 407 pound-feet of torque. Both V8 engines come with a six-speed automatic transmission. The base engine on the Toyota Tundra is a 4.0-liter V6 that produces up to 270 horsepower and 278 pound-feet of torque. The V6 engine comes with a five-speed automatic transmission. The second engine choice is a 4.6-iter V8 that produces a peak 310 horsepower and 327 pound-feet of torque. A 5.7-liter V8 is the largest and most powerful engine choice, producing 381 horsepower and 401 pound-feet of torque. The Chevrolet Silverado 1500 comes with four different engine options. The base 4.3-liter V6 produces a weak 195 horsepower and 260 pound-feet of torque. From there a 4.8-liter V8 engine produces a much more impressive 302 horsepower and 305 pound-feet of torque. A 5.3-liter V8 offers a slight improvement of 315 horsepower and 335 pound-feet of torque. The largest engine is a 6.2-liter V8 that pounds out a thunderous 403 horsepower and 417 pound-feet of torque. The two smaller engines come with a four-speed automatic transmission, while the two larger engines come with a six-speed automatic transmission. Finally the Ford F-150 also comes with four different engines. The smallest engine offering out of all five pickup trucks is a 3.5-liter V6 that works with twin turbochargers to put out an amazing 365 horsepower and 420 pound-feet of torque. Ford offers another small engine, a 3.7-liter V6 that produces a surprising 302 horsepower and 278 pound-feet of torque. The next engine up is a 5.0-liter V8 that kicks out a healthy 360 horsepower and 380 pound-feet of torque. And finally the largest engine of them all is a 6.2-liter V8 that belts out 411 horsepower and 434 pound-feet of torque, meaning the F-150 comes with the most powerful engine option out of all five trucks.